Want to know where the good birding spots are, how to get there, and what you can expect to find? Take a look at our newly updated Finding Birds in Guilford County. PBC member Dennis Burnette researched and produced this guide to 28 publicly-accessible sites across the county, primarily parks and preserves. The description of each site includes GPS information and driving directions; background information on the site; recommended viewing locations; and a discussion of species often found there. In addition to the individual site descriptions, the guide includes driving directions for Dennis’ “Tour of the Greensboro Lakes,” a day-tour of spots to look for waterfowl, along with land birds near the water’s edge. 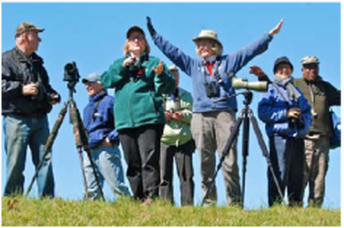 Finding Birds in Guilford County is a great resource for visitors and newcomers to the area, as well as residents looking for a refresher on the county’s birding opportunities. Go to the Resources tab or click here. ​Of the 24 candidates that met the criteria for 2018 Bird of the Year, George Wheaton narrows the field to 11 that historically have been reported five or fewer times. His ultimate choice is ...? Read the article here. Agree with his choice? If not, tell us which bird gets your vote. Apr. 18 Program: What is a Uwharrie and Why Would a Biologist Care?